Unbeknownst to me, I started learning about feudal Japanese history, Japanese pronunciation, and Kyushu dialect when I was 11 or 12 years old, sitting in front of the tele and the Super Nintendo. 「話にもならんわ！」I couldn’t understand it back then, but that’s what Amakusa says when he wins a battle. We could translate it to “You’re pathetic!” or something like that, but he says it in Kyushu dialect (which is considered very rough in other parts of Japan) with a sentence-final “wa,” considered a marker of feminine speech outside of certain Tokyo dialects. There was no one named “Tokugawa” in the game Samurai Shodown so some of Amakusa Shiro Tokisada’s lines left me a bit confused. That was about 20 years ago. But little by little, I came across more things in real life that I’d first seen in the game. I learned about the Tokugawa Shogunate, I learned about the problems with romanizing Japanese, and understood why the voice overs in the game pronounced this character’s name as “Shirou” even though the letters said “Shiro.” And most interestingly for me, I learned that Amakusa Shirou Tokisada, presented in the game as an evil sorcerer with poor taste in makeup, had actually been a boy in the 1600s who led a failed Christian uprising on Kyushu, the Shimabara Rebellion. When I first heard about the “kakure kirishitan,” or “hidden Christians” in Japan, I was fascinated by how people so far from Christianity’s origins would end up such stout converts as to lay down their lives for their new-found beliefs. In contrast, I enjoyed going to Mass because the church and artwork inside were visually stunning; yet even so, I hadn’t gone all that often, and never did the catechism. 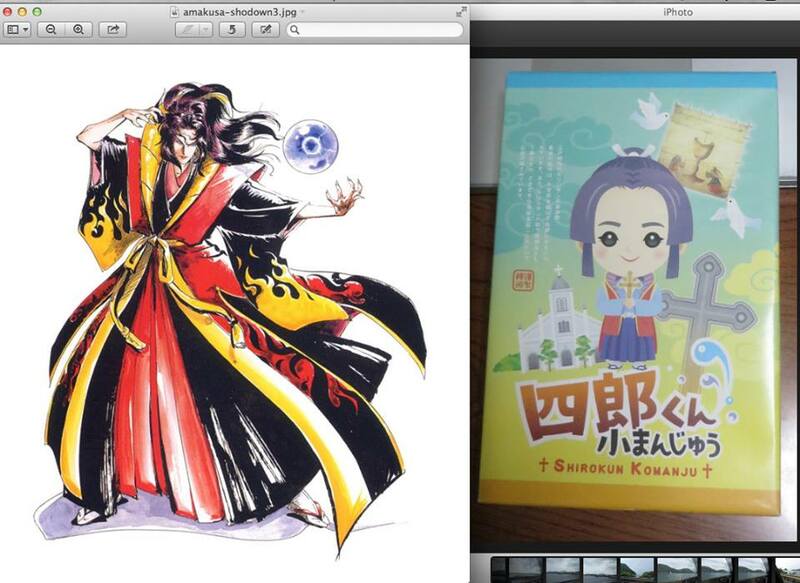 Between this and my colorful, pixelated introduction to Christians in Japan, I was bound to end up in Amakusa some day. As I wrote in the previous post, I went to Amakusa in July of 2013 thanks to the kindness of a fellow gym member who offered to drive there. She didn’t have much time so it was a day trip, which is a bit insane considering it’s a 4-hour drive from Fukuoka. 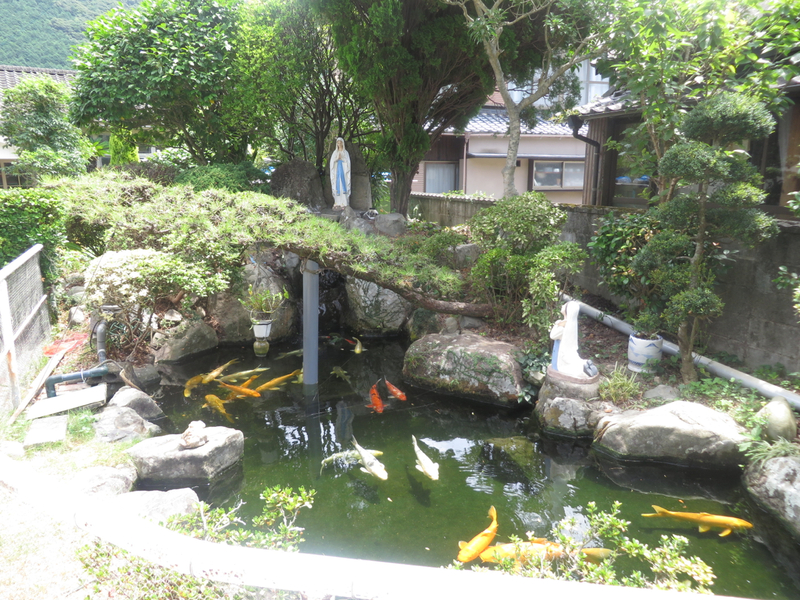 All we did in Amakusa was see two famous churches, have lunch, and walk around a couple of touristy spots. As such, perhaps this post won’t be particularly edifying, but I still thought it was an interesting trip. For a brief, but deeper explanation of the history of this place, read this article: Amakusa and the Hidden Christians. 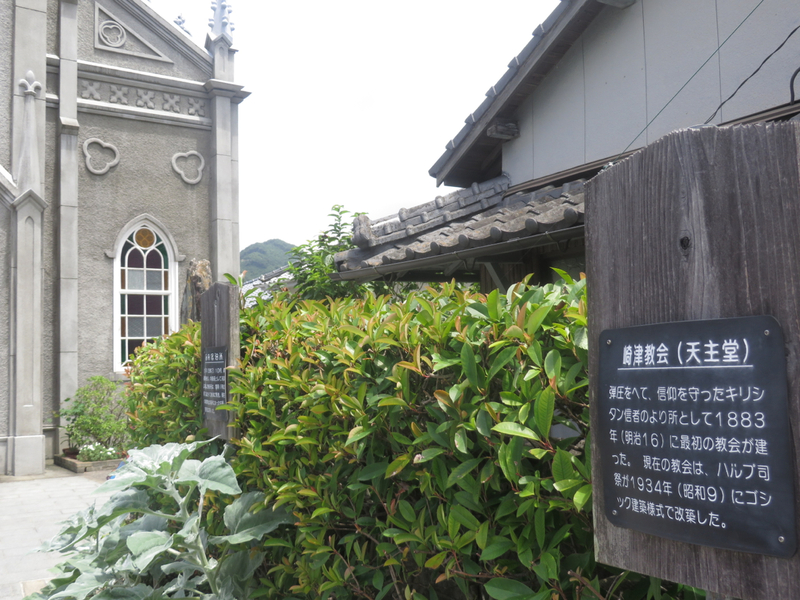 First, we went to Sakitsu Church (崎津教会, also 崎津天主堂 Sakitsu Tenshudou). It’s tucked away among sleepy, narrow streets. We didn’t have time to go in to Gallery Café Nazareth, but it was clear we were on the right track. 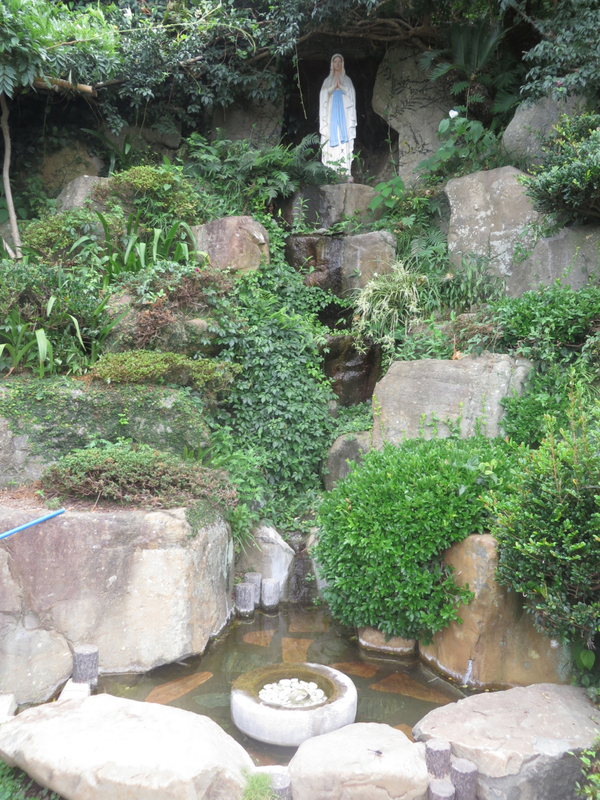 A representation of the grotto of Our Lady of Lourdes near the church. A beautiful Gothic church near the sea! The plaque informs us that the first church built in this spot was built in 1883, after the ban on Christianity was lifted. The current, Gothic building was erected in 1934 by Father Harubu (Havre?). Photography was not allowed inside, but I picked up the postcard set the church had for sale. (On an honor system at that. Put 500 yen in the box, take one of the sets laid out on the table.) Unfortunately, I can’t find said postcard set, though I know for sure I brought it with me, as I showed it to my mother. 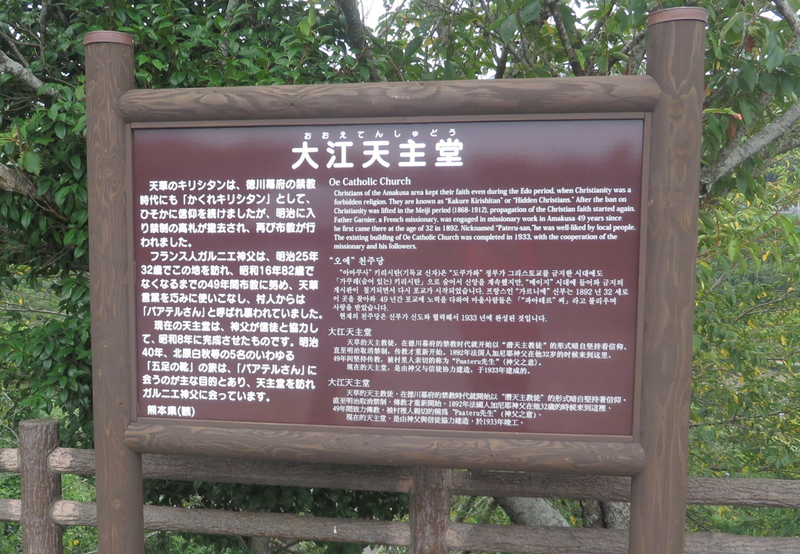 Hmm…well, in any case, here’s a Japanese site with pictures of the interior, as well as a more detailed history of the church, if you’re curious. The tatami mats are the only things that make it seem different from a Catholic church in the West. 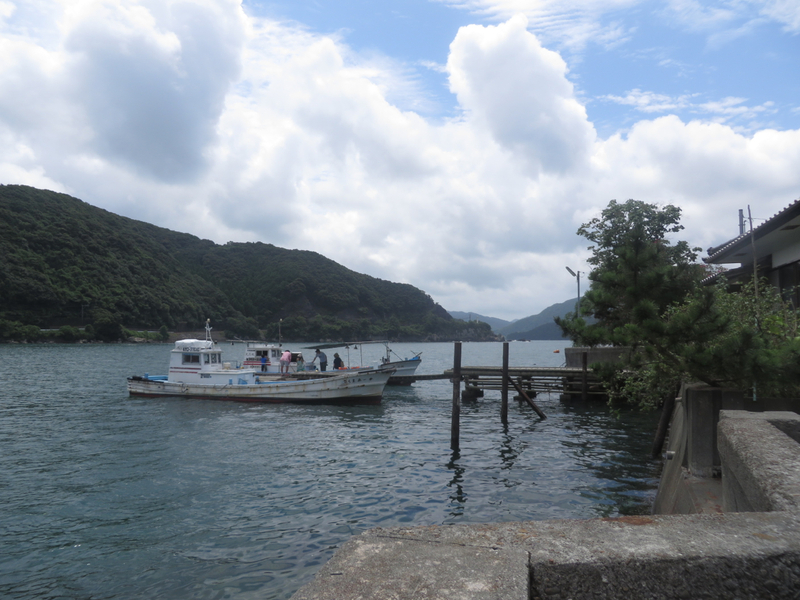 The sea lies just a few steps from Sakitsu Church. 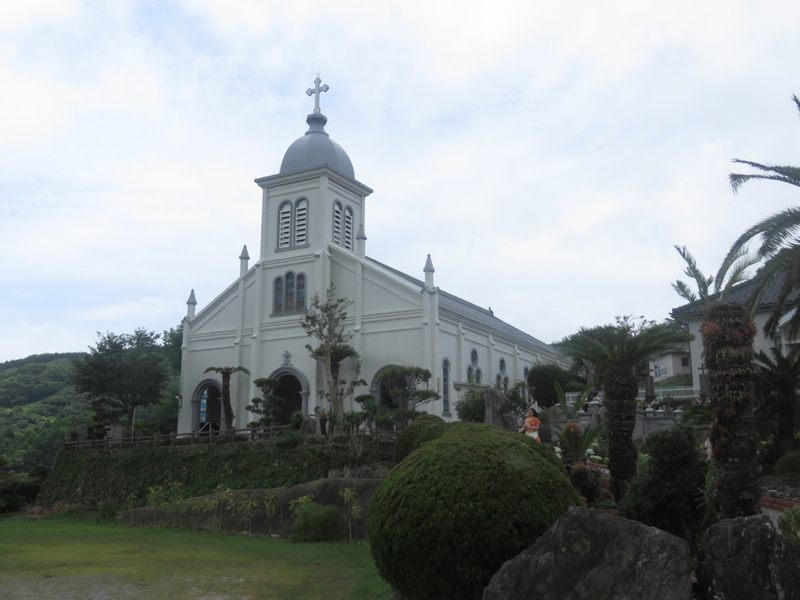 Next, we headed to Ooe Church (大江教会, also 大江天主堂 Ooe Tenshudou). On the way, we saw a junior high school student riding a motorbike. 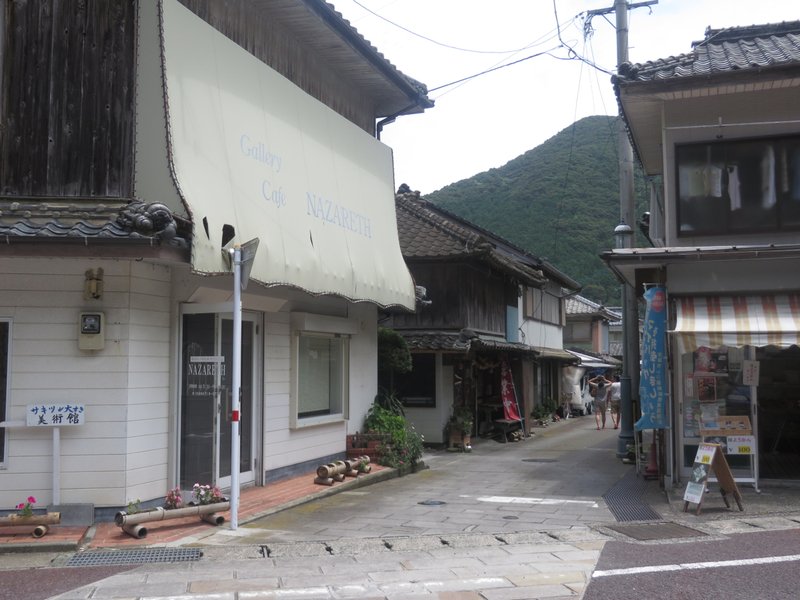 That’s how you know this is the countryside (=inaka). There’s just no other way to get around, so even the lil’uns have to (or “get to”) drive. Anyway, Ooe Church sits atop a hill. 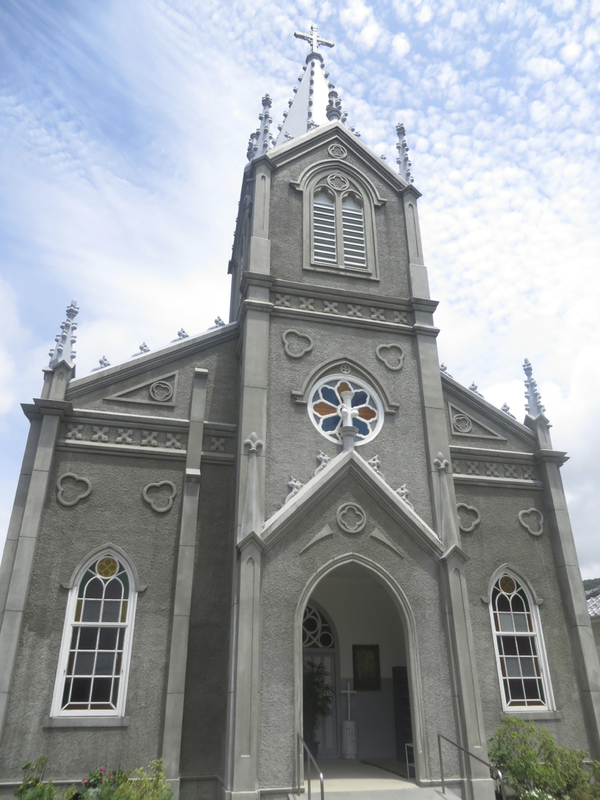 We actually saw a couple at this church who had also been at Sakitsu Church. Maybe they were looking for a place to hold their wedding? Photography inside this church is also prohibited. I picked up a postcard set here as well, but alas. (One day, I’ll find those postcards and update this post. ^_^;) But again, you can see some interior photos at this Japanese site. It’s impossible to tell from those photos, however, that there’s a figure of a samurai up on the altar. Wearing his swords and everything. Ooe’s grotto of Our Lady of Lourdes. It’s tucked away on a lower part of the hill, at the side of the church. Before leaving, my friend insisted I take a picture in front of the church. It felt a little strange, ahaha…. After seeing these two churches, we set out to look for lunch. We found a restaurant not too far from the foot of Ooe Church’s hill with a banner saying they had lunch specials, so we decided to go there. 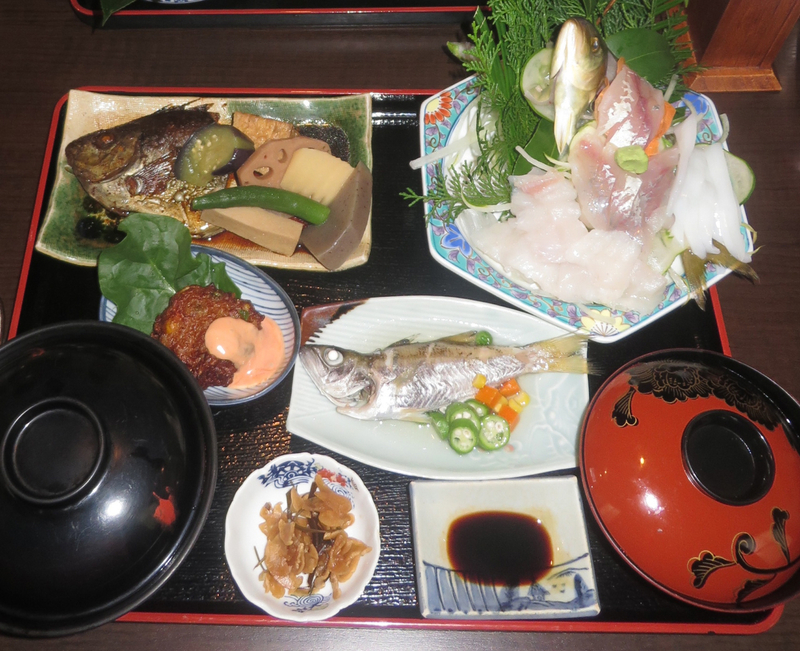 Amakusa is particularly known for seafood, so that’s what we had. I don’t remember what any of these fish were. But they were good and fresh! After lunch we hit the road for Fukuoka. 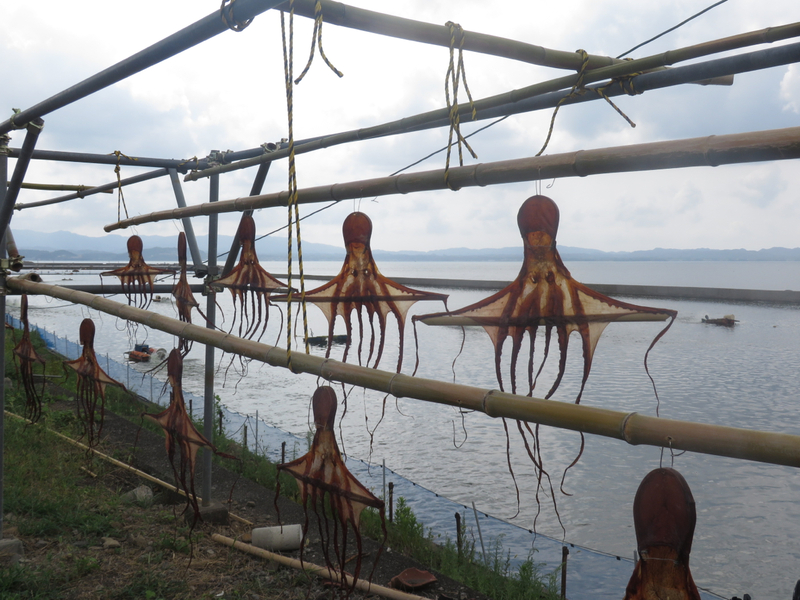 We happened to come across some octopuses being dried outside, which apparently is also something Amakusa is known for. If I remember correctly, this is 干したこ (hoshi tako), meaning simply “dried octopus.” You can eat it as a snack! We went to a rest stop so that I could buy omiyage. I wasn’t planning on taking any of it home with me, rather it was for the school, as a “thank you” rather than as souvenirs. I was pretty amused by the chibi Amakusa Shirou Tokisada imprinted on various omiyage boxes. 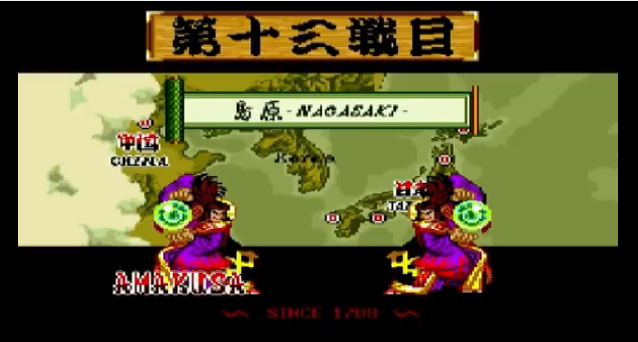 Left: Amakusa Shirou as drawn in Samurai Shodown III. Right: Shirou-kun on a box of manju. I’m willing to bet both representations would be funny to the real Amakusa Shirou if he could see them. On the way back to Fukuoka, we were unexpectedly stuck in traffic. As we crawled forward, I saw why: we were near a huge statue of Amakusa Shirou, and people were crowding into the small parking lot before it. Given that we were short on time I said I wouldn’t mind if we didn’t turn around to see it ourselves. Later, I found out that it was the Aino Amakusa Mura. 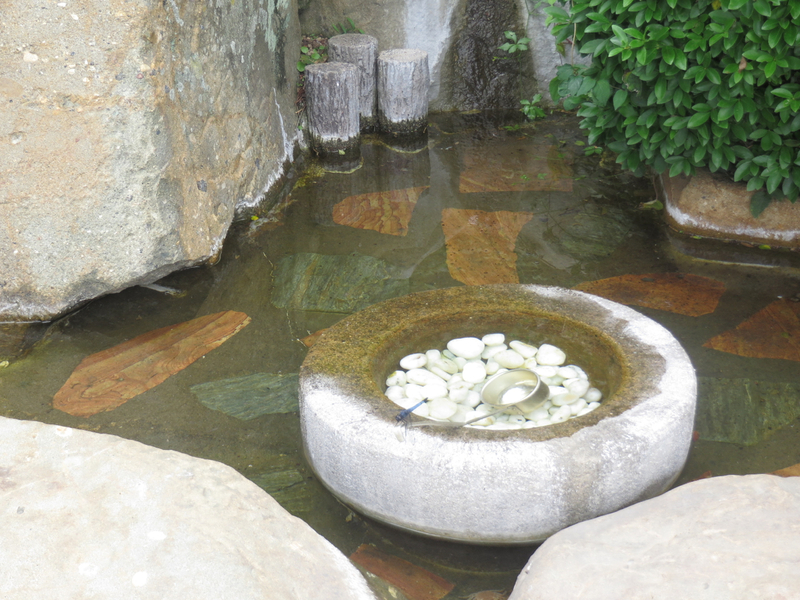 Other monuments to Amakusa Shirou are in Shimabara, which we couldn’t also visit given the time constraint. We had set out around 7 in the morning, and were back in Fukuoka at 7 in the evening. I said goodbye to the kind woman who’d taken the time to make a rushed trip far south, and went back to the mess of moving in my apartment. I made very few trips on JET, and this was the last. The first kanji I learned were the numbers from 1 to 13, thanks to Samurai Shodown. As I played, I noticed that some of the symbols changed with each battle while the others stayed the same the whole time, so I figured the symbols that changed represented the number of the battle. Of course, it’s fairly easy to confirm, since 1, 2, and 3 are 一、二、三. But still…who says video games don’t teach you anything?! The above screencap, as well as the one at the top of this post, was taken from AcidGlow’s Amakusa playthrough video. I found it really interesting to watch the playthrough now that I can read and understand all the untranslated Japanese elements! And I realized that Haohmaru’s stage is Ganryuu-jima, which I’ve also been to. Samurai Shodown was apparently based on an 80s movie called Makai Tenshou, in which Amakusa Shirou is also the villain. Huh. I wonder if I can find this movie somewhere. This was the church I’d sometimes go to in my neighborhood. I found it pretty interesting to hear Mass in Japanese. Since Christianity was first introduced to Japan by the Portuguese, many elements are in said language, and since Portuguese is very close to Spanish, I could figure things out. For example, “Mass” is ミサ (misa) in Japanese, and that’s also the Spanish word (and Portuguese word too, I assume) for it.